We upgraded the 5W mini speaker with more stable charging port to improve customers' experience. Built in 1000mAH Li-Ion battery could support continuous play time in wireless condition,75-84db for 5 hours playback, 50-70db for 15 hours playback . In 33 feet range could be connected with Bluetooth. 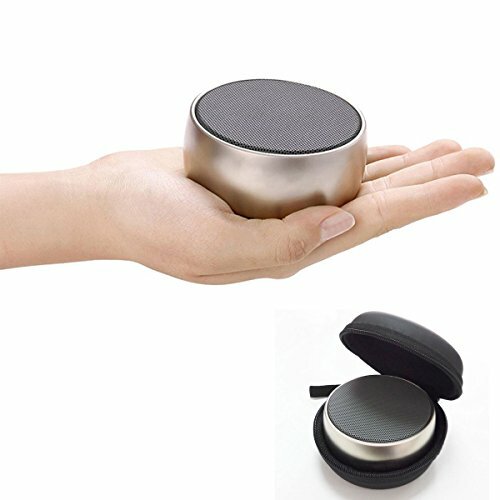 It is wireless and worriless as a Bluetooth speakers; There is an AUX jack offer more chance to connect speaker with phones, tablet, Mp3 and PC, more way, more chance with your Portable Wireless Speakers! You can find not only Bluetooth is available, but also support FM radio and TF card play, multi-function offer much pleasure. If you have any questions,please contact us at "support@gracetop.com"
Superior Sound Quality: Experience your music in full-bodied stereo realized through high-performance drivers and a unique spiral bass port. Compact And Powerful: Full metal housing Super-portable Bluetooth speaker delivers powerful sound and robust bass through a 5W audio driver and passive subwoofer. Unstoppable Music: Bluetooth, micro SD support and AUX support for endless audio options. Extended Playtime: Anker battery technology supplies 15 hours of continuous playtime on a single charge; more than double what comparable speakers offer. What You Get: Gracetop mini Speaker, Micro USB charging cable, Advanced speaker package, welcome guide, our worry-free 18-month warranty and friendly customer service.